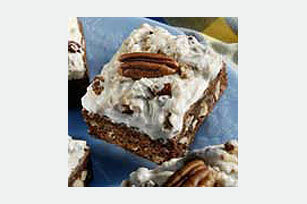 Switch things up with this recipe for yummy Frosted Pecan-Coconut Brownies. Frosted Pecan-Coconut Brownies are unique way to dress up everyday brownies. Preheat oven to 350°F. Reserve 32 pecan halves for garnish; coarsely chop remaining pecans. Beat eggs and 2 cups of the brown sugar in large bowl with wire whisk until well blended. Add butter, chocolate and vanilla; mix well. Stir in flour and salt until well blended. Add 1/2 cup of the coconut and 3/4 cup of the chopped pecans; stir. Pour batter into lightly greased 13x9-inch baking pan. Bake 30 min. Cool completely in pan on wire rack. Mix frosting, remaining 1/2 cup coconut, remaining 1/4 cup brown sugar and the remaining chopped pecans; spread over brownies. Cut into 32 pieces; top each with 1 pecan half. Store in tightly covered container at room temperature. Since this indulgent brownie recipe makes 32 servings, it is the perfect dessert to serve at your next party. Use a food processor to quickly chop the pecans. Makes 32 servings, 1 brownie each.